Forget the myths. You don’t need to live in New York or L.A. to become famous. It didn’t work that way for R.E.M., playing their way through the small city of Athens, Georgia. There are some great ways to get more fans without having to book a world tour. There is something to be said about the fact that the Beatles played sold-out performances at Liverpool clubs before anyone in America knew their name. They were Liverpool’s band first. Don’t try to conquer to world right out of the starting gate. You may have noticed this thing called social media that all the kids are raving about? Facebook should be a professional platform for news and announcements. Forget the pictures of the cat sitting in the guitar case. Twitter is the place for fun stuff and mini-updates. Keep it band-related. No politics. Instagram is where you get to play around a bit. Feel free to post pics from last night’s after-gig party. Put a more human face on your image. Yes, that’s a pretty long heading, but read it carefully. Read it again. Building a fan base is like growing a plant. It doesn’t happen overnight. It happens in stages and only through careful cultivation and diligence. If you want to get more fans, you must remember that this is the age of interconnection. Encourage fans to share things you post. Engage them in dialogue. Hold contests. Don’t be afraid to send out a personal email every once in a while to thank a fan for his or her contribution or loyalty. 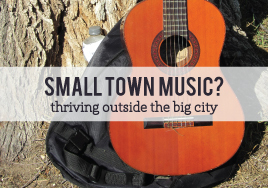 Are you a small town musician? What steps have you taken to help your band thrive?